Paolo Benedetti was born in Fasano(BR) on the 3rd of January, 1995. He studied at the Politecnico di Bari(Italy), obtaining his bachelor degree in Electronics and Telecommunications Engineering(Telecommunications curriculum) in 2016 and his master degree in Telecommunications Engineering in 2018. 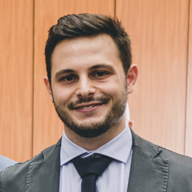 Since November 2018, he is a Ph.D. Student at the Dipartimento di Ingegneria Elettrica e dell'Informazione(DEI) of the Politecnico di Bari.